It all started when I was reading an excellent book by Andrea Wulf entitled The Invention of Nature: Alexander von Humboldt’s New World. The book provides many details about Humboldt’s fascinating life and the wide-ranging influence he had on science and society. When reading the book, you can easily understand the unquestionable role Humboldt played in the history of ecology and biogeography. One of his many contributions to science was to set the basis for explaining how environmental factors affect species distribution; for example, he demonstrated that vegetation systematically varies across the world with climate and showed the ecological similarities between altitude and latitude. Fig. 1. 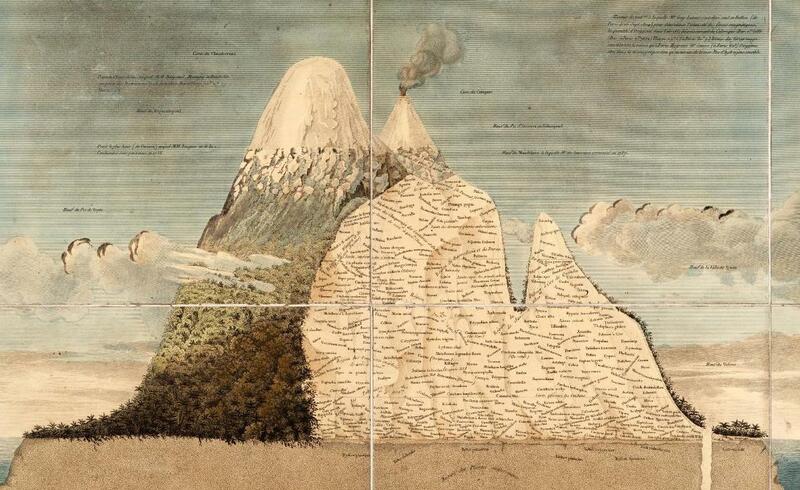 Vegetation of Chimborazo (Ecuador) by Humboldt and Bonpland (1807). A question that came to my mind was not covered by the book; namely, to what extent does Humboldt’s view bias our vision of nature? 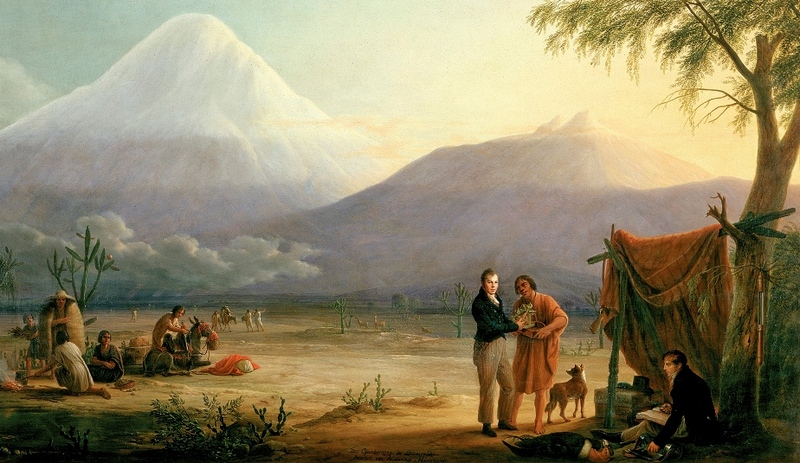 This is relevant because many classical naturalists and ecologists, such as Henry David Thoreau, Charles Darwin, George Perkins Marsh, John Muir, Rachel Carlson, Frederic E. Clements, and Henry A. Gleason, were all inspired by Humboldt. By spreading a vision, they shaped what is today mainstream ecology and the environmental movement. The current emphasis on the role of climate and soil in many ecological and evolutionary studies, the emphasis on forests as the potential and most important vegetation, and the difficulties many researchers have accepting the ecological and evolutionary role of disturbances at broad scales, suggest that we are still largely viewing nature through the eyes of Humboldt. After reading the book, I was lucky enough to be in London for a conference and met William Bond in a pub just next to Kew Gardens. We stayed hours talking about many things, mainly fire, grazing, alternative stable states, and all the wonders of ecosystems maintained by disturbances. Our conversation jumped from one country to the other, from one biome to the other, and from one continent to another. And when talking about the overwhelming role that many researchers attribute to the environment when explaining broad temporal and spatial vegetation patterns , we glimpsed the long shadow of Humboldt. That conversation in a quiet London pub was the seed of this paper (and of another to come). Talking with William is always enjoyable because of his enthusiasm, experience, and creativity. Now that we are approaching the 250th anniversary of Humboldt’s birth, it is instructive to evaluate his legacy of climate and soil as primary factors explaining broad vegetation patterns. There is increasing evidence that many open, non-forested ecosystems (savannas, grasslands, and shrublands) cannot be predicted by climate and soil – and are ancient and diverse systems maintained by fire and/or vertebrate herbivory. 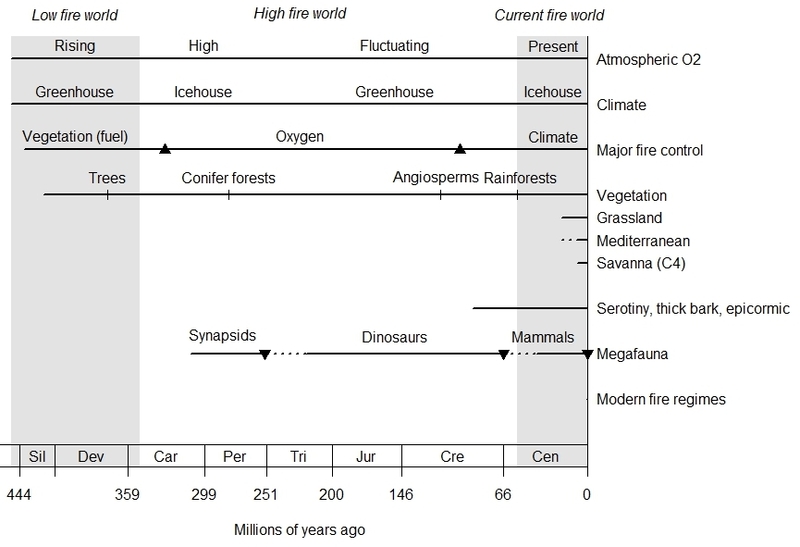 Paleoecological and phylogenetic studies have shown the key role of fire and grazing at geological time scales (Fig. 2). In this paper , we propose moving beyond the legacy of Humboldt by embracing fire and large mammal herbivory as key factors in explaining the ecology and evolution of world vegetation. This implies understanding grasslands, savannas, and shrublands as ancient and diverse ecosystems that require conservation, including the processes that maintain them (grazing and wildfires). Fig. 2. Changes of the drivers related to plant consumers (fire and herbivory), together with the evolution of different vegetation types, and some plant traits (serotiny and thick bark of pines, epicormic resprouting in eucalypts), along the evolutionary history of plants. Upper pointing triangles are peaks of O2 atmospheric concentration and fire activity; lower-pointing triangles are megafauna extinction events, also associated to fire activity peaks. Note that modern fire regimes are very recent, and at this scale they are almost a point. From . In a recent paper , we studied the relationship between plant diversity (Fig. 1a) and fire activity (Fig. 1b) for the different ecoregions of the world, and found a strong positive relationship (Fig. 2), even after taking into account productivity and other major environmental variables . This is the first global assessment of the importance of fire as major determinant of species diversity. There are at least two (not mutually exclusive) mechanisms by which fire may drive plant diversity at the scale and grain considered. 1) A selective process; there is both micro and macro evolutionary evidence suggesting that fire regime can drive population divergence and diversification [2-5]. And 2) Fires generate landscape mosaics and thus more habitat types and more niches likely to be filled by different species. In fact, the two processes are linked as landscape mosaics are also appropriate frameworks for population divergences and selective processes in fire-prone ecosystems . That is, our results suggest that fire generates the appropriate conditions for a large variety of plants in many regions worldwide. Or, in other words, a world without fires (if possible at all) would be less diverse. Fig. 1. 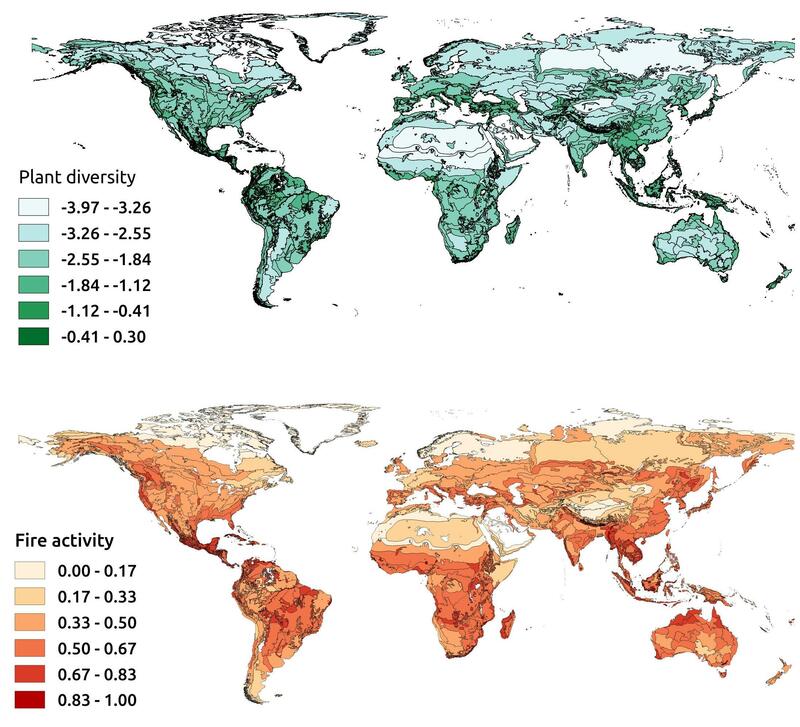 Maps of plant diversity (logarithm of the number of species divided by the ecoregion area) and fire activity (estimated by 15 years of remote sensing data for each ecoregions, standardized from 0 to 1) for each terrestrial ecoregion of the world. From . Fig. 2. Plant diversity in each terrestrial ecoregion (number of species divided by area, log scale; Fig. 1a) plotted against an indicator of fire activity (Fig. 1b); the two lines refer to fitted lines for low and high radiative power (an indicator of fire intensity). Form . There is a tendency to think that fires will increase in the near future due to global warming. This is because many fire risk prediction are based on climate only. However fire regime changes not only depend on climate ; there are other factors, like land-use changes, CO2, plant invasion, fragmentation, etc. that are also important drivers of change in fire activity . Even plant drought stress (and flammability) not only depends on climate [2,3]. 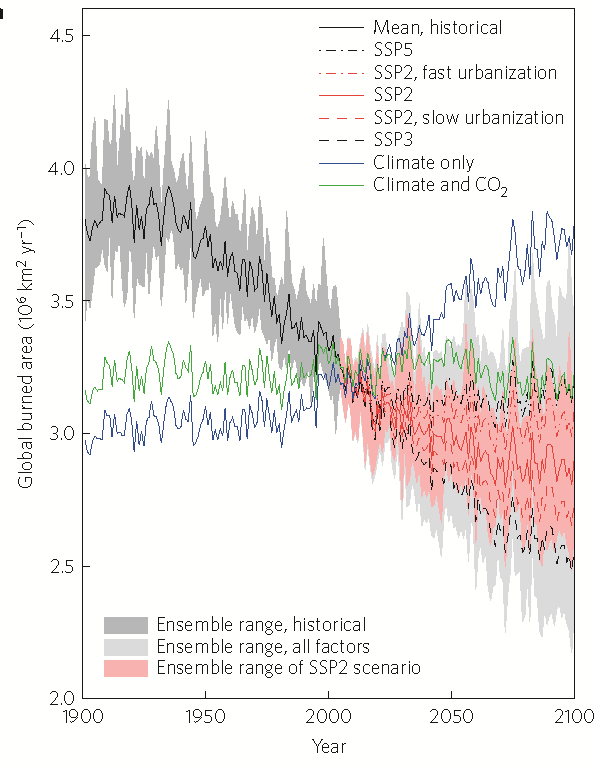 A recent simulation study  suggests that global burned area is certainly predicted to increase in the following decades when simulations are based on climate only (blue line in the figure below). However, adding the effect increased CO2 reduces the predicted burned area to no increase (green line below). Furthermore, when adding increased population density and urbanization (black and red lines), the model predicts much more area burnt in the last century (black lines 1900-2000) and a reduction of future burned area (red lines). The predicted reduction of fire during 1900-2000 is consistent with global charcoal records  and can be explained by increasing agriculture, land use and fragmentation. Overall, this study suggests that global area burned is unlikely to increase in the following decades. Note that 1) this is a model, so take it with caution! 2) This model is at the global scale, but changes in different directions are expected in different regions, and this can have biodiversity consequences (even if the global balance is steady); for instance, in the Mediterranean Basin, fire are likely to keep increasing as land abandonment and fuels are increasing . And 3) there is a high uncertainty in some fire drivers. For instance, temperature is likely to keep increasing, however, rainfall and wind changes are very uncertain, and landuse and emissions are subject to uncertain changes in environmental policies in different countries. In any case, this study gives us an idea of the possible sensitivity of different parameters. Figure: Simulation of global area burned for 1900 to 2100 under different scenarios: a) climate only (blue line); b) climate + CO2 (green); c) climate + CO2 + population & urbanization (black lines; red area for the future predictions). From . Luo, Y. & H. Y. H. Chen. 2015. Climate change-associated tree mortality increases without decreasing water availability. Ecol, Let. 18:1207-1215. Knorr W, Arneth A, & Jiang L, 2016. Demographic controls of future global fire risk. Nature Clim. Change 6:781-785. Marlon JR, et al. (2008). Climate and human influences on global biomass burning over the past two millennia. Nature Geosci, 1, 697-702. The overview effect is the feeling and awareness reported by some astronauts when viewing the entire Earth during space-flight. Fire ecologists have our own overview effect! When remote sensed fire information was available for the first time at the global scale, it provided a magnificent and unprecedented view of the importance of fires on the Earth, and fires become a global issue. This remotely sensed information was a very valuable data because, for the first time, it was possible study some fire ecology processes at the global scale (for example ). Here is an animation for a 10 years period (2000-2010). It shows that on our planet, fires are widespread and something is always burning; we live in a flammable planet. MODIS Rapid Response System Global Fire Maps, NASA. Each colored dot indicates a location where MODIS detected at least one fire during a 10-day period. We have used remotely sensed fire information for the whole globe and aggregated this information by the WWF ecoregions, to produce an ecologically-based global fire map (figure below ). Using this map we have tested the intermediate fire-productivity model [2,3], i.e. that ﬁre activity changes along the productivity/aridity gradient following a humped relationship. The results suggest that fires occur in all biomes and in nearly all world ecoregions. Fire activity peaked in tropical grasslands and savannas, and signiﬁcantly decreased towards the extremes of the productivity gradient. Both the sensitivity of ﬁre to high temperatures and the above-ground biomass increased monotonically with productivity. 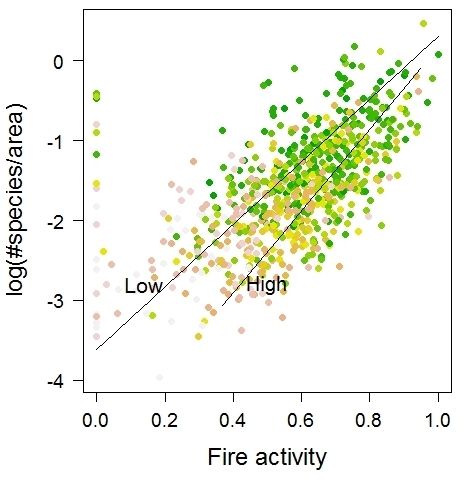 In other words, ﬁre activity in low-productivity ecosystems is not driven by warm periods and is limited by low biomass; in contrast, in high-productivity ecosystems ﬁre is more sensitive to high temperatures, and in these ecosystems, the available biomass for ﬁres is high. The results support the intermediate ﬁre–productivity model on a global scale and suggest that climatic warming may affect ﬁre activity differently depending on the productivity of the region. Fire regimes in productive regions are more vulnerable to warming (drought-driven ﬁre regime changes), while in low-productivity regions ﬁre activity is more vulnerable to fuel changes (fuel-driven ﬁre regime changes ). Figure: An ecologically-based global fire map, from Pausas & Ribeiro (2013) . The shape file is available under request [email here]. Pausas J.G. & Ribeiro E. 2013. The global fire-productivity relationship. Global Ecol. & Biogeogr. 22: 728-736 [doi | pdf | erratum] – UPDATE: Paper featured by NASA.